Last weekend I went for a girls’ dinner with CC and LW. 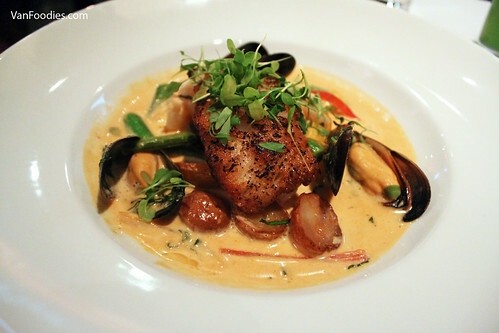 It’s Taste of Yaletown time, which means we were able to order a prix fixe menu for an affordable $25, $35 or $45. 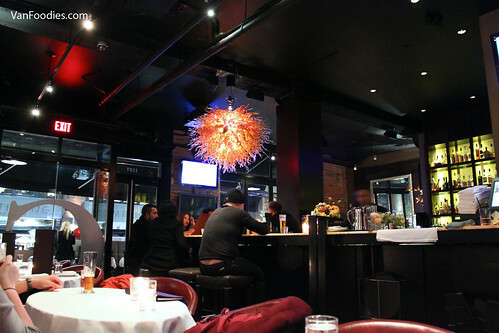 We initially wanted to try Brix because it had a more appealing menu; unfortunately they were closed for a private event so we were offered a table at the sister operation, George Ultra Lounge. Turns out both Brix and George offer the same menu, which is a combination of what was posted on the Taste of Yaletown website. They kept the best part of both menus, i.e. lots of appealing meat options, so we could order a few different things to try. And they operate out of the same kitchen, so it didn’t make a difference whether we dined at Brix or George in this case. 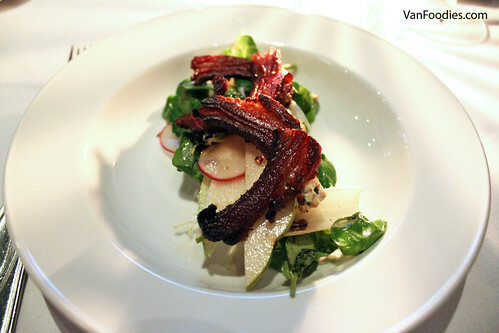 For appetizers, I ordered the Lamb Bacon Salad. I don’t think I’ve ever had lamb bacon before so that was quite intriguing. It was similar to pork belly; it had equal distribution of meat and fat, fried to a crispy yet meaty texture. It wasn’t overly fatty or greasy either. It had a bit of gamey taste but that’s partly why I enjoy eating lamb. The salad was well balanced with soft and crunchy elements, and hint of bitterness from the endives and radish; they used a pungent, blue-cheese like cheese, which I wasn’t a fan of. CC and LW both ordered the AAA Beef Carpaccio. 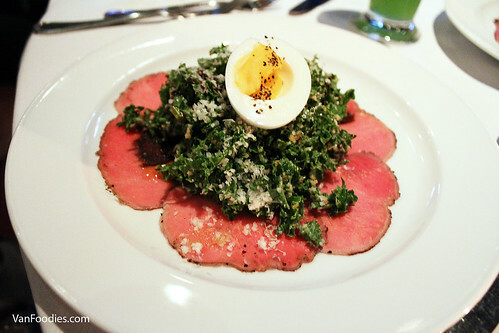 Thinly sliced beef along with a healthy portion of kale salad and anchovy vinaigrette — this dish had the reminiscence of a caesar salad but healthier. I thought the seasoning was quite spot on for this one; the 8-minute egg tried to add creaminess and richness to the dish but it didn’t do much for us. 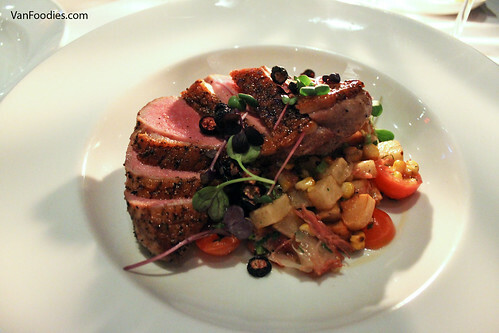 The Brome Lake Duck Breast on the menu definitely caught my eyes. 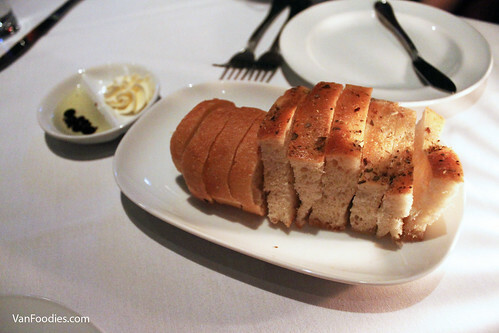 It’s not something commonly found on a menu, especially prix fixe. There was a huge piece of duck breast cooked to a perfect medium — the skin was crispy with some sweetness from the maple glaze, the meat was tender and moist. All that was sitting on top of some duck confit succotash. Yes, more duck. It was rich, flavourful. It was a succulent dish. For LW she chose the Roasted Ling Cod. It was a beautifully seared piece of cod. Nice, crispy crust, while the meat was still flaky and soft. There was a good amount of plump mussels. I just wish the Thai coconut curry sauce was slightly thinner. Lastly, desserts. Obviously we wouldn’t miss the opportunity to try both options. 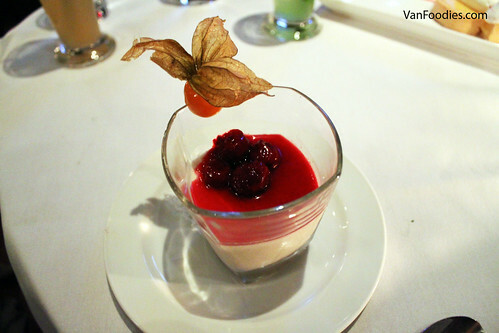 The Vanilla Bean Panna Cotta was rich and creamy, and I liked that they used a sour cherry compote. The tartness in the sour cherries definitely cut through the richness of the pudding. 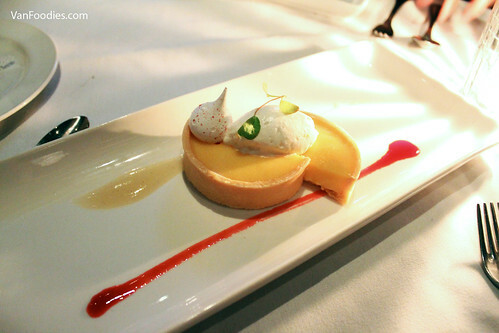 The Passionfruit Tart had its share of tartness too (haha pun intended). The crust was buttery but held up really well against the passionfruit filling, which tasted tropical and tart. The addition of chantilly cream cut through the amount of acidity, and the subtle lemon flavour was really nice. Overall this dessert was refreshing and was a nice finish to our meal. The restaurant was really busy on a Saturday night — tables getting turned around, a number of big parties being at the restaurant — but our server was still friendly and attentive to our table of three. What I was confused about, though, was the positioning of the restaurant. Looking around, it’s a lounge, but it also has a large bar area with sports playing on big screen TVs. It also had a live DJ playing music. Casual while dressy, with a party feel to it…hmm…. For $35, this Taste of Yaletown dinner was probably the most enjoyable prix fixe dinner that I’ve had in the last little while. Food tasted good, portion was decent; we left the restaurant happy and satisfied. Yaletown has been perceived as the area for high-end/fancy dining with (relatively) smaller portions; this dinner made me feel otherwise. And it was good! Would get it again!